Rodney Ascher’s Room 237 is a documentary film showcasing several different theories surrounding Stanley Kubrick’s The Shining as extolled by obsessive fans of the movie. Each one has their own unique take on what the great director was really trying to say in the film, where the notoriously meticulous Kubrick seemingly laces his movie with a myriad of hidden messages and meanings. The end result is an enjoyable glance at some obscure interpretations of The Shining, even if the analysis offerRoom-237-Film-Reviewed won’t be firmly convincing anyone anytime soon. One interpretation is that the film is secretly about the genocide of the Native Americans by white settlers; a second posits that it is about the Holocaust and the Nazi’s final solution. A third sees it as Kubrick’s admission of guilt over faking the moon landings. The fourth focuses on the impossible nature of the Hotel’s layout while a fifth highlights some interesting juxtapositions found when two prints of the film are played over one another with one going forwards and one backwards. 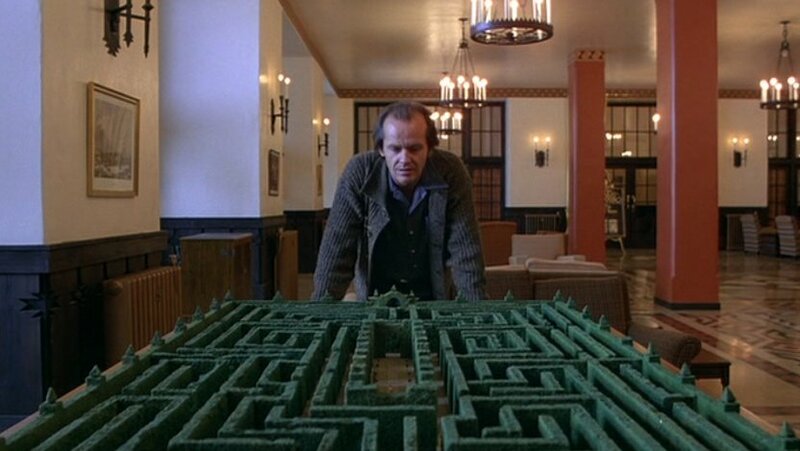 The various theories are illustrated and supported by extensive footage from the film itself, the accompanying making-of documentary, snippets from Kubrick’s other movies and the odd diagram charting the position of various rooms in the mysterious Overlook Hotel. There are several interesting little observations picked out along the way but none of the theories really offer a fully fleshed out critique of the film. None of them really fully explain how their theory relates to the film on a broader level. The Native American strand at least offers some interesting spots from the movie you may have missed before, and you could argue that a perfectionist like Stanley Kubrick includes everything for a reason, adding some degree of relevance to the findings. The Holocaust and Moon Landings themes though are pretty darn tenuous and it actually gets a little bit amusing seeing the facts twisted to vaguely, sort of, kind of, relate to these arguments. The double-projection stuff meanwhile is a neat coincidence but nothing more. The really fascinating strand for me, and I imagine for other Kubrick fans too, was the theory looking at the unworkable floor plan of the Overlook Hotel. I’ve watched online videos explaining the geographical errors and impossible windows in the Overlook before, but this is the highest quality production yet. The highlighting of corridors to nowhere and unfeasible doors is a movie geek’s dream come true, even if the overall theory doesn’t really go anywhere. This does bring up the major issue one may take with Room 237, namely that while it has interesting trivia and moments of intriguing observations to offer, they are mixed in with an awful lot of silly hokum and you have to mentally separate the wheat from the chaff. Providing you’re willing to do this and can accept that some of the more out-there theories as exactly that, out-there theories, then you stop worrying about gaining conclusive proof and instead just sit back and enjoy. What makes Room 237 such a treat for movie fans isn’t the intrinsic value of each theory as such; it’s the passion and the obsession that goes into forming them. We’ve all spent far too much time deconstructing our favourite movies. Many of us will have read many a movie blog which offers a surprisingly coherent take on a movie such as Donnie Darko or trawled a forum looking for hints as to just what Mulholland Drive was all about. Room 237 is simply this obsessive fandom thrust into film form. It raises questions about how we, as a viewer, absorb a film and to what degree the director’s original motives come into play once the film enters into the public sphere. Stanley Kubrick doesn’t take sides with any particular theory and makes no attempts to debunk any of them. This is a film that embraces the dedication of fans, even if the evidence offered doesn’t come close to backing up their point. This is a film about cinematic obsession and made for cinema obsessives.